Video clip synopsis – Tuan observes that his father’s reunion with the Xuan Phu villagers is just like a family reunion. His father was a cellist in the Hanoi Symphony Orchestra that took refuge in the village during the Vietnam War. Broadband MP4 symphony_bb.mp4 (12.5MB), suitable for iPods and computer downloads. On arrival in Xuan Phu, Tuan observes that his father’s reunion with the villagers is just like a family reunion. At the 1960s site of the underground orchestra, there is a discussion about the dimensions of the campus, now covered by banana palms. Observed by curious local school children, we see preparations for the concert. The outdoor concert comprises a traditional Vietnamese orchestra performance, as well as the Hanoi Symphony Orchestra performance. The whole village community, as well as members of the military, enjoys the concert. The clip ends on a note of hope for the future with Professor Huong smiling and receiving a bouquet. Vietnam Symphony – an underground symphony family is an excerpt from the documentary Vietnam Symphony, produced in 2005. Vietnam Symphony is a Film Australia National Interest Program in association with Stonebridge Productions. Developed with the assistance of the Australian Film Commission. Produced in association with the NSW Film and Television Office and SBS Independent. 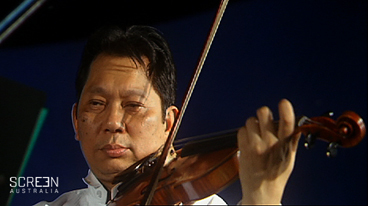 Vietnam Symphony – an underground symphony family is an excerpt from the documentary Vietnam Symphony, produced in 2005. When Tuan witnesses his father’s reunion with the villagers, he feels it is the same as a family reunion. Why is this an appropriate analogy? How important is ‘family’ in Vietnamese culture? Why? What is the importance of ancestors? Is this similar, or different, for you in Australia? There is one day of the year in Australia when reunions connected to wartime take place across the nation. What is this day? How and why do they also resemble family reunions? The outdoor concert program caters for all generations. What different styles of music are presented? (Consider popular culture, traditional and classical styles). How does the audience react during rehearsal and the actual show? Give examples. The film conveys that music and performance have a certain magic for human beings of all ages and backgrounds. Which images strongly show this? What devices and camera shots does the director use to convey this? Research traditional Vietnamese musical instruments eg zither, lute, monochord, two-stringed fiddle, percussion. What are their names in Vietnamese? Invite local Vietnamese community musicians to play at your school. Tuan now values his father’s story and the extraordinary survival story of the Hanoi Orchestra. Will the making of the film and the reunion concert alleviate the fears of the professor about his son and the future? Do we see evidence of any other young Vietnamese classical musicians? Do you feel that the director is presenting a story about music and cultural heritage, or about relationships and human behaviour? Give reasons for your opinion and cite appropriate scenes. Present this in a two column table, using ‘Music and cultural heritage’ and ‘Relationships and human behaviour’ as headings. Are there skills and professions in your family that your parents and/or grandparents encourage you to follow? How do you feel about this? Are there any patterns of occupations in your family history? Do these occupations derive from other cultures? Research information about your family and include this information as a flow chart/family tree, indicating each member, their relationship to the family and what their occupation was. Wheeler, 2007, Lonely Planet ,Vietnam Guide, Lonely Planet. 5th edition.